They say rain on your wedding day is good luck. When we are preparing for our couples, we take the weather into consideration. Capturing a wedding on a sunny day is easy, but what happens when the weather isn't what you hoped for. This is where we step in to give you beautiful portraits no matter what. We are well trained in lighting no matter what the weather or location. This portrait is one of our favorites and lots of couples joke that they kind of hope for a raining day so we can create something similar for them. This rainy day allowed us the opportunity to capture one of our best DC wedding photos. If you are willing to give us the chance, we love to create a unique work of art with you! This bride and groom took a chance and braved the rain to capture this one of a kind wedding portrait at Stone Tower Winery in Leesburg, VA. The bride didn't care if she got her dress a little muddy to take this shot down by the pond below the hills of vines. It was worth braving the cold spring rain to get this photo of them kissing under the umbrella. 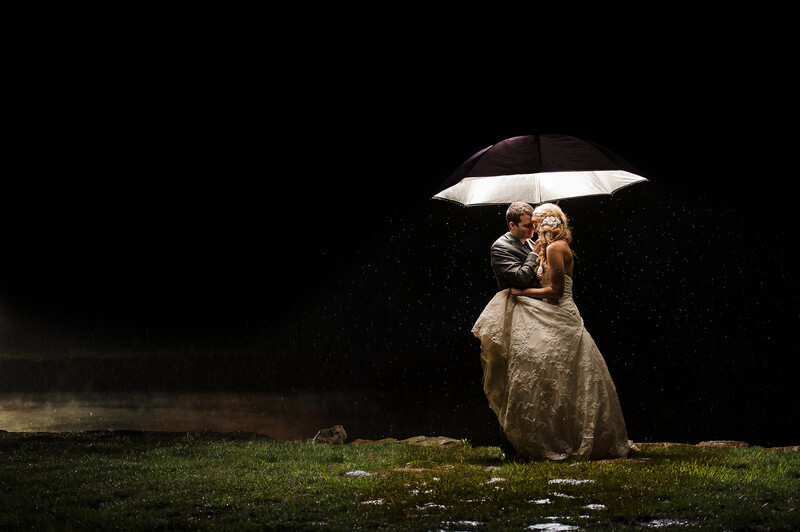 The groom helped her keep her dress out of the mud while having this romantic moment. Stone Tower Winery is a gorgeous wedding location, rain or shine. From beautiful rolling hills covered in luscious grapevines to their well appointed tasting room and wine cellar, the photo opportunities are endless. Nestled in between the vineyards is a large pond with a stone wall and rustic wooden doors. This location is a popular place to capture a few photos together or with your wedding party or friends or family. Your portraits will be ones that your friends and family will gush over. The staff at Stone Tower are helpful and accommodating. They work to make sure your wedding day vision comes to fruition. They help you to pick the perfect wines to pair with your nuptial day feast. No guest is going to leave your wedding without being well fed and happy. The wines at Stone Tower are no ordinary wines. They are grown, produced, and bottled from grapes grown on over 75 acres on Hogback Mountain. Your friends and family will be delighted at the white and red offerings as well as the small plantings the vineyard offers every year. Located on the outskirts of Leesburg, Stone Tower is close enough to hotels and shopping for your out of town guests. They can enjoy walking the streets of the historic district of Leesburg or nearby Purcellville and Lucketts. The restaurants and arts scene is abundant. Quaint coffeeshops are the perfect place to relax the morning after celebrating your wedding. Location: 19925 Hogback Mountain Rd Leesburg, VA 20175.